An international study led by UCLA researchers has found that a personalized vaccine may help people with glioblastoma, the deadliest form of brain cancer, live longer. The vaccine, known as DCVax-L, uses a person's own white blood cells to help activate the immune system to fight cancer. Nearly 30 percent of people in the ongoing trial have survived for at least three years after they enrolled in the study. Currently, the average life expectancy for people diagnosed with glioblastoma is 15 to 17 months, and less than 5 percent of people who receive standard treatment survive more than five years after they are diagnosed. "The survival rate is quite remarkable compared to what would be expected for glioblastoma," said lead author Dr. Linda Liau, professor of neurosurgery at the David Geffen School of Medicine at UCLA and a member of the UCLA Jonsson Comprehensive Cancer Center. "The 20 to 30 percent of long-term survivors in immunotherapy clinical trials are the people in whom we think there may be a particularly strong immune response against their cancer that is protecting them from getting tumor reoccurrence." Interim findings from the phase three study, which is still in progress, were published in the Journal of Translational Medicine. It is the largest trial to date testing a customized vaccine in people diagnosed with brain cancer. People who had recently been diagnosed with glioblastoma were given the vaccine at 80 sites around the world from July 2007 through November 2015. Before the trial, each participant underwent surgery to remove the tumor, followed by chemotherapy and radiation. The median length of survival for all subjects in the study was 23.1 months — eight months longer than the median survival time from previous studies using chemoradiation alone. And, at the time of the analysis, 108 of the 331 people in the trial (32.6 percent) were still alive. "The unique thing about the DCVax-L vaccine is that it doesn’t target a single antigen," Liau said. "This treatment actually uses the patient's own tumor specimen to make the vaccine. This is really a form of personalized immunotherapy that is customized to an individual patient and his or her tumor." UCLA researchers have spent almost two decades studying how they could activate a specific type of white blood cells, called dendritic cells, to fight brain cancer. Dendritic cells typically alert the immune system when it detects a foreign invader. 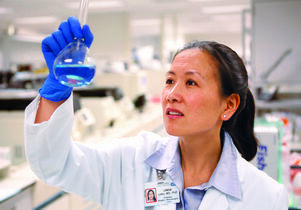 In the late 1990s, Liau and her team were the first to test a dendritic cell–based vaccine in people with glioblastoma, a type of tumor that had previously been thought to be immune-privileged, meaning the immune system won't attack it. However, Liau and her colleagues were able to demonstrate that the body could actually mount an immune response against tumors in the brain following the vaccination. DCVax-L works by combining brain tumor tissue proteins removed during surgery with dendritic immune cells generated from the person's own blood. The dendritic cells are activated in the lab to turn against the tumor cells and then injected back into the patient, activating the person's T cells to attack the tumor. In short, the vaccine teaches the immune system to battle the cancer. Researchers are continuing to monitor the study participants to assess the long-term survival statistics for the treatment. Meanwhile, Liau and her colleagues are developing new therapies for brain cancer that combine the vaccine with other treatments. 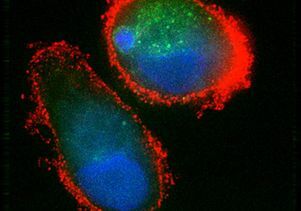 The research was supported by Northwest Biotherapeutics, Inc., which manufactures DCVax-L, and by the National Cancer Institute through the UCLA brain cancer program, which was recently designated a Specialized Program of Research Excellence by the NCI. In addition to Liau, other authors of the study from the Jonsson Cancer Center are Dr. Robert Prins, professor of neurosurgery and of molecular and medical pharmacology; and Timothy Cloughesy, professor of neurology and director of the neuro-oncology program at UCLA.